In the past few months the media have been increasing our awareness of plastic pollution and its effects on our oceans. According to Greenpeace, an estimated 12.7 million tonnes of plastic end up in our oceans each year. That’s a truckload of rubbish a minute. These staggering figures are something the world’s leaders couldn’t ignore. 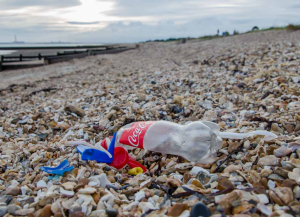 Recently, nine countries from the Commonwealth have joined the effort hoping to eliminate single use plastic from our oceans. With whole countries getting involved, can we do our part? At Dunsters Farm we are very conscious of our responsibility to play our part in reducing and reusing plastic. We are also keenly aware of our need to reduce our impact on the environment and although this is not the easiest task for a delivered wholesaler, we are taking decisive action to show our support. At our depot, we have changed our lighting to LED’s to reduce our energy use across the business and have installed an electric charging point for our electric vehicles to use on site. Additionally, we have revised our vehicle routes to enable us to back-haul from suppliers wherever possible, reducing our carbon footprint and our food miles. We have also been working with our suppliers to move to more recyclable packaging, use recycled plastic wherever possible and reduce their use of plastic. All these changes take time but we are making good progress and are excited for the future. 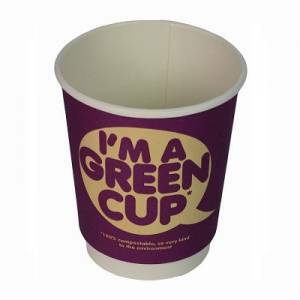 Most recently, we have listed a full Eco range of biodegradable disposables such as food trays, paper straws, soup containers and cups and other packaging – already firm favourites with our customers. Does your catering business really need to be thinking about sustainability? The short answer is, yes. In the past, if a business didn’t think it was possible or profitable to go green it didn’t need to and wouldn’t suffer. However now, with the world’s awareness of environmental issues ever increasing, businesses across all sectors have accepted they can’t afford to ignore the issues either. In the beginning, the idea of going green can seem overwhelming. In the catering business waste can be difficult to control. So start with one simple change – use compostable packaging. But first, what is Compostable Packaging? Compostable packaging is made from plant-based, recycled materials and when disposed of correctly, can return to earth quickly and safely as soil. The benefits of using compostable packaging to the environment are significant. It requires less carbon to produce, reduces the amount of waste sent to landfill and doesn’t produce toxins as it breaks down. on your overall company image. It shows you’re responsible and care about the world we live in. those customers coming through the doors. carbon footprint and going green it is sure to make a positive impact. In conclusion, we can all play our part! Check out Dunsters Farm’s new selection of compostable packaging and disposables here. With over 30 different kinds of plastic-free food and drink packaging you are sure to find what you need.